The real winners in terms of votes are the small parties. The Greens were able to double their result from about 6% in 2005 to 12% which now makes them the third largest party in the state parliament. The new leftist party ‘Die Linke’ was also able to win considerable votes and will now for the first time enter North Rhein-Westphalia’s parliament. Free Democrats remained about the same. 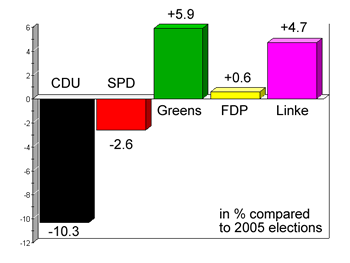 The only two realistic coalitions are either a grand coalition of the two large parties, SPD and CDU, or a coalition of SPD, Greens and ‘Die Linke’. The former is problematic because since both parties have the same amount of seats, who will be the prime minister of the state? SPD’s Hannelore Kraft who has declared herself the winner of these elections or CDU’s former prime minister Jürgen Rüttgers? Or someone else? The second coalition with ‘Die Linke’ is problematic because all other parties have so far refused to include them in any sort of government. Political views differ to much, so they say. The results of these elections also have far-reaching repercussions for national politics. 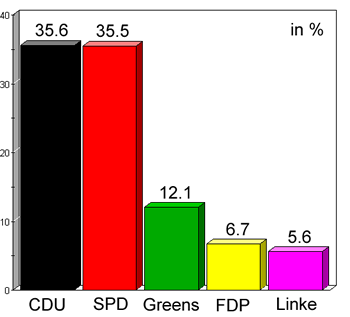 The government of CDU and FDP no longer holds a majority in Germany’s upper house, the ‘Bundesrat’! This means that even when the government passes a new law through the ‘Bundestag’, which is the lower house of parliament where they do have a majority, the other parties will be able to block that same law in the upper house later on. As a prompt response, Chancellor Angela Merkel has announced to immediately stop all discussions about tax cuts, which were a major plan of the government before yesterday. Because the law wouldn’t pass anyways. Other political decisions on a national level will need much stronger cooperation between the parties from now on for the very same reason. These are tough times ahead for Germany’s government.